Royal Queen® features Multi-Core® construction, combining many different layers of metals. Carbon steel absorbs and holds the heat in a similar manner as cast iron. Aluminum alloys captures and spreads the heat evenly, so the pan heats from the bottom up, sides in and top down. T 304 stainless steel inside and out provides strength, beauty, effortless cleaning. This Multi-Core® engineered cookware performs on all ranges: electric, gas, magnetic induction and glass top cooking surfaces. 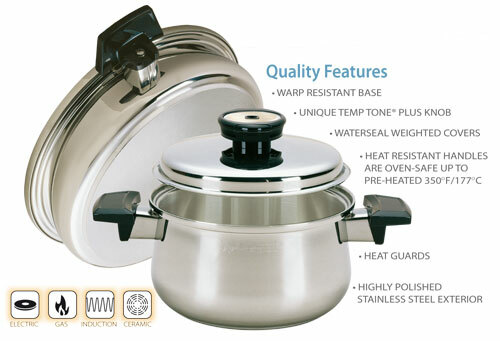 Royal Queen® Stainless Steel Cookware is warranted by Regal Ware, Inc. to be free from defects in material and craftsmanship for the lifetime of the original purchaser. cookware is a discontinued cookware line and is in no way associated with Le Cordon Bleu International BV"